The Centers for Disease Control and Prevention estimates that at least 23,000 people die every year from antibiotic-resistant bacteria, and warns that the widespread overuse of antibiotics on factory farms is putting our health at risk. 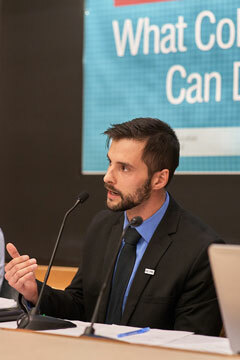 Nearly 70 percent of medically important antibiotics sold in the U.S. are for use on factory farms. We know we can get factory farms to stop misusing our life-saving medicines if their biggest customers commit to buying meat that’s been raised without routine antibiotics. 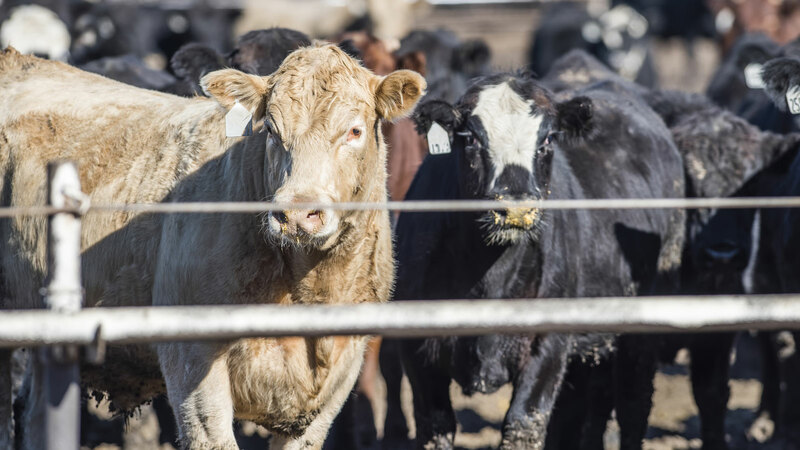 After a year-long campaign targeting the largest purchaser of beef in the United States, we secured a commitment from McDonald’s that it will reduce medically important antibiotics use in its beef supply. See what it took to win. 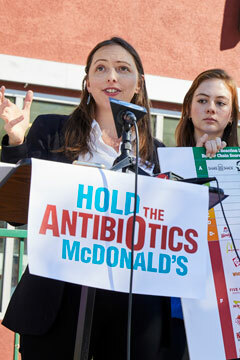 After securing commitments from Subway, KFC and McDonald’s to serve chicken raised without using medically important antibiotics, we launched our “Hold the Antibiotics: McDonald’s” campaign, calling on the company to commit to a timeline to phase out the routine use of antibiotics in it’s beef supply chain. 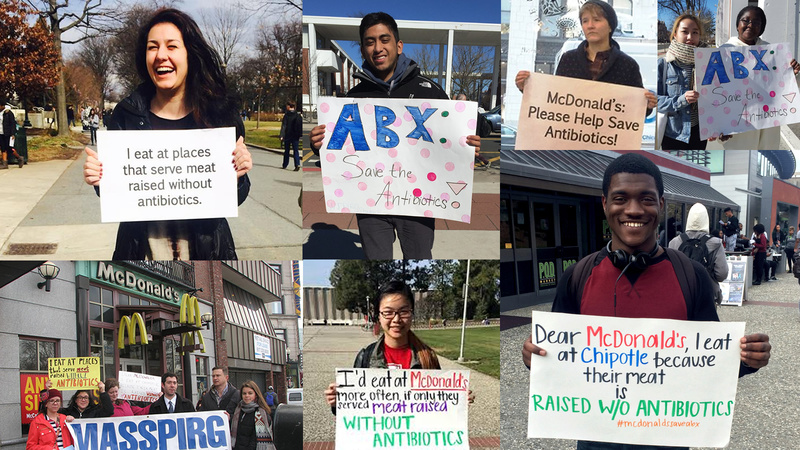 We brought together more than 80 stakeholder groups to call on McDonald’s to cut routine antibiotic use in its entire meat supply. 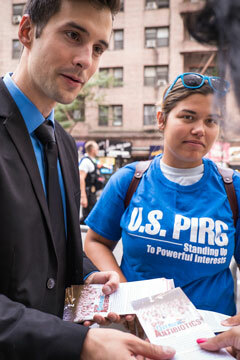 At McDonald’s annual shareholder meeting, U.S. PIRG Education Fund and our partners delivered 160,000 petition signatures from consumers across the country. 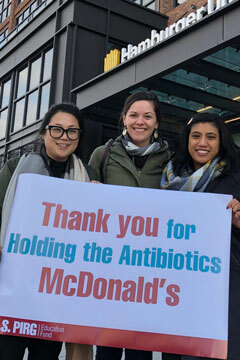 Through our citizen outreach operation, we had more than 180,000 conversations with the public and connected with medical professionals about why McDonald’s should hold the antibiotics. 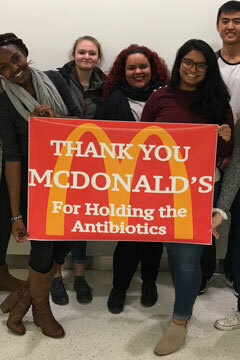 At the fourth release of our annual “Chain Reaction” report, we delivered McDonald’s an “F” grade based on the antibiotics use for the beef they source. That day, McDonald’s publicly stated that it would roll out a global antibiotic policy for beef by the end of 2018. 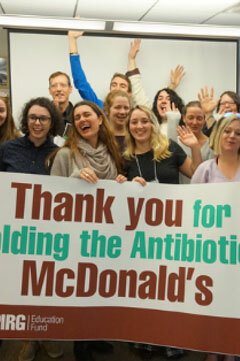 VICTORY: McDonald’s commits to monitor and reduce medically important antibiotic use in its global beef supply. This commitment, coming from a fast food chain that serves 1 billion pounds of beef in the United States each year could spark industry-wide change and have huge impacts on public health. See what we’re working on now. The beef industry purchases the most medically important antibiotics out of any meat sector. 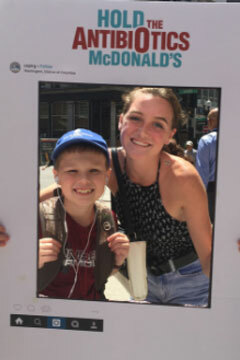 If more major burger chains, like Wendy’s and Burger King, commit to no longer purchase beef raised with our life-saving medicines, it can accelerate the change that McDonald’s started. And we don’t have time to waste. 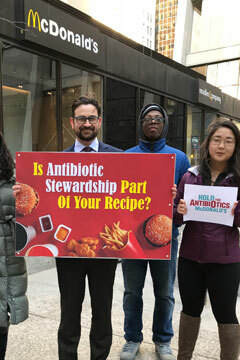 Several of the more than 30,000 photo petitions and signatures we collected calling on McDonald’s to eliminate medically important antibiotics from their chicken supply chains. McDonald's recently committed to monitor and reduce the use of medically important antibiotics in its beef supply chain. If more burger chains follow McDonald's lead it can help accelerate industry-wide change to stop overusing life-saving medicines.